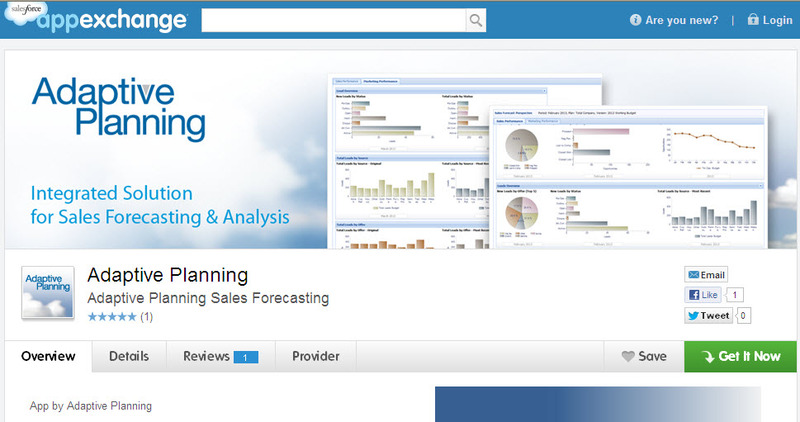 Adaptive Planning’s Sales Forecasting & Analysis Solution allows companies to extend their Salesforce investment by providing new capabilities for both backward-looking analysis and forward looking planning of sales, including top-down forecasting, management adjustments, snapshots of data, and automatic integration of sales and financial plans. Integrated with Salesforce, the solution enables sales, finance, and executive teams to view, modify, and collaborate on key pipeline and other sales data in ways that were previously not possible. For example, sales managers can augment their Salesforce forecasts with outside data without changing the underlying CRM data. Sales managers can create and compare multiple snapshots of the pipeline, period-to-date quota achievement, and other data, for variance analysis and insight into what has changed over time. In addition, both sales and finance executives can make top-down adjustments to the bottom-up forecast, before incorporating the sales forecast into the overall financial plan. With the Sales Forecasting & Analysis solution, companies can create more accurate forecasts, analyze what-if scenarios, and improve overall sales execution, resulting in more predictable sales and increased company revenues.